It's still raining ... the dams here are predicted to overflow by Monday. I will be taking some time this weekend to get some vintage in my kitchen. If you read my blog you'll know I'm a vintage glassware admirer. Pyrex, Fire King all the old glassware from a time when women did their hair to do the dishes. I relish the ornaments from that era, not so much the societal values. 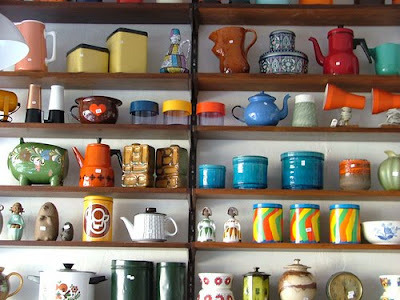 I am working on getting a wall like this in our kitchen ... just slowly chipping away. These are some of my vintage glass favourites. Pink glass cake stand my Mum gave me ... with a kick-arse 'fluffy frosted' syrup cake. Fruit bow that sits in my Mum's kitchen window (complete with ceramic green frog). A stacker of beautiful ramekins from my Mum ... good for ice cream. Just as well I don't know where you live, or I'd be over nicking some of that fabulous Pyrex. 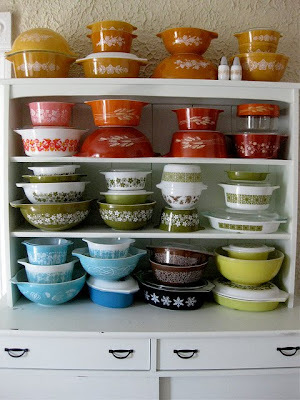 That is an awesome Pyrex collection - thanks for finding and showing it to us! I have a mixing bowl that matches the casserole dish on the second shelf, on the left (the white one with the red birds on it). I love it! the colours are so rad on all the old stuff, seriously, they just don't make it like they used to!! Oh my gosh, we have something in common!!! I love love LOVE 1950's glass (and porcelain) too!! Love the pics and the frog salad bowl is sooooo cute!!! This is most awesome. I seem to be acquiring so much vintage kitchen ware I need to buy a bigger unit. be still my beating heart. i started collecting milk glass/fire king when i was in the US. freakin amazing..that first image...well...sweet dreams all round. 2018 - Be still, my heart. Robyn Lea — Bohemian Living. NEW DESKTOP CALENDAR FOR OCTOBER! There should be a sign. Lino Forest - Mixing Craft and Colour. Suitcase Rummage has a new Website! Retirement Sale... 50% off Everything! Where do I find postcards? Green tea, don't give up!!! Style Me Vintage: Clothes. A Giveaway: Now Closed! vinyl spiral bunny shirts for AGB! Is your child a 'prosti-tot'? A Timeless Tea Party at the Curious Oyster Shoppe - By Betty Jo! Normal is a cycle on a washing machine. Studio one ... tweets a giveaway.